I will be reading a Christmas books about idioms to the kids today at the Christmas party. I love idioms so much I could eat them. On Sunday, LG and I discovered that the phrase “sticks out like a sore thumb” isn’t an idiom at all, but a tried and true description. 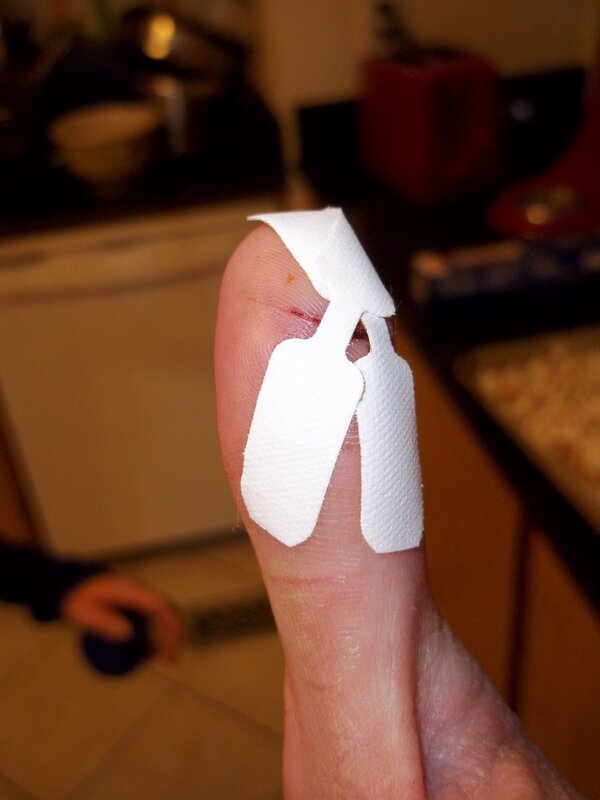 I cut my thumb good while making hashbrowns. OUCH! LG was so kind and wrapped up real tight to stop the excessive bleeding. The wrapping seemed to multiply from the roll to the application. My thumb was humungous by the time he got done. Of course this happened on the Sunday that Abigail and I were scheduled to sing in church. so while singing I had to ignore the throbbing. I wasn’t about to hold it up for everyone to see. For some reason I have been having a bad week. This morning while Caroline and I were cleaning up all the books she had dumped out all over the floor, my bad week was hopefully finalized. Caroline was wearing her pink cowboy boots and she stomped down hard on my thumb re-tearing open the wound. Did that just make you squirm? Because it did for me. What a boring post, but that photo is pretty cool, huh? Ouch! That must have killed when it got stepped on. Hope it heals quickly! I don't think it's boring at all… shows another way that we are alike. I always have kitchen knife mis-haps.I hope it heals quickly. My sister and I both don't like band-aids much… having to use one drives us both nuts. My pointer finger on my left hand is past the band-aid stage… I slipped and cut it while dicing tomatoes for Tony's salad about a week ago.